Pain under the kneecaps and along the outside of the hips, as well as a few other areas of the lower extremities, are common complaints for women. The discomfort is often associated with the shape and mechanics of women’s hips and knees and, surprisingly, the way women sit. Sit Like a Man (S.L.A.M.) is a call to action for women to change their sitting behavior to prevent pain. A simple change in the way women sit can affect an entire generation of girls. Fewer will suffer from kneecap and hip pain and other adult leg and hip conditions. While sitting may seem like second nature to most, the way women sit could be contributing to their hip, knee, and even back and ankle pain. Sitting with knees and legs together and/or ankles and legs crossed is a modern learned behavior. Women have been taught this practice at an early age for almost a century. In the early 1900s, when skirt lengths crept up above the ankle it was considered more lady-like to have the ankles crossed. As skirt lengths rose, the practice turned into leg crossing. Today, it is a common sign of modesty, and a necessity when wearing short skirts. Cave women most certainly sat around with their legs apart, because there was no reason for them not to. And women in long skirts sat with their legs apart for the same reason. You have only to look at an infant female to see the natural way legs want to go. Female babies and toddlers do not sit with their legs together. Neither do men. Sitting with the legs on the floor and slightly apart takes the tension off the iliotibial band, the longest tendon in the body, and the greater trochanter, the tendon that stretches across the big bone at the side of the hip. These are often the culprits that cause lateral hip pain (hip bursitis) after the age of 40. Let’s not forget there will be times when keeping the knees together and legs or ankles crossed is more appropriate, like when women wear a skirt or dress. But most of the time, women are in situations where sitting like a man is acceptable and, more importantly, translates to better overall health. How can we begin to prevent hip bursitis and other ailments? Sit naturally…sit like a man. Place your feet flat on the ground. If you're tall, raise your seat. If you’re short, place your feet on a step. Your legs should be slightly apart Your thighs should be angled as if they were pointing to the 11:00 and 1:00 position on a clock, or greater. Allow your thighs to gently rotate outward. Do not place your feet outside of your knees. That causes the thighs to rotate inward and the knees to angle inward as well. 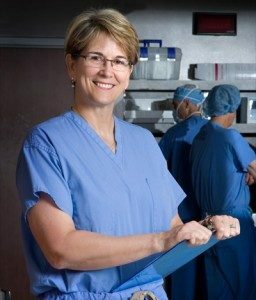 Dr. Barbara Bergin is one of the founders of Texas Orthopedics, the largest orthopedic specialty clinic in Central Texas. She has treated countless women for serious orthopedic conditions caused by everyday behaviors like wearing the wrong bras and shoes and carrying heavy handbags. You can read more about this in Dr. Bergin’s blog Straight Talk About Bone & Joint Pain Inspiration for Sit Like a Man (S.L.A.M.) stems from deep behavioral roots and the hope that one day “sit lady-like” will no longer be a young girl’s learned habit. Dr. Bergin is an engaging speaker whose approach captivates audiences from community groups to academia to medical professionals. As a general orthopedist and one of only a small percentage of female orthopedic surgeons in the country, she draws from more than 30 years of experience and couples this with her love of teaching to help educate, inspire, and motivate audiences. As a public speaker, Dr. Bergin presents and discusses topics ranging from her women’s health initiative - S.L.A.M.™ (Sit Like a Man) - to female empowerment by instilling confidence in young women. She is often asked to give her fundamental presentation, “Ten Tips to Success,” to various audiences, young and old, male and female. Dr. Bergin is a published author, singer/songwriter, and a competitive equestrienne in the Western performance horse sport of reining. Learn more about Dr. Bergin. To ask Dr. Bergin to speak to your organization, contact Leslie Branon, Community Relations Director, (512) 439-1100 or lbranon@txortho.com. About 90 percent of her patients with pain under their knee caps or along the outside of their hips are women, including Cherie Hall. Hall told KVUE, "The pain was so excruciating, so bad, that I almost feel like I am tired of living," she said. "It was here, all the way into the lower back and hamstring." Dr. Bergin explained how the “lady-like” way of sitting can wreak havoc on some women. But most importantly, she demonstrated how you can S.L.A.M. to avoid these aches and pains.